Bamford got Leeds up and running just after the hour mark before he headed home with 76 minutes gone as the visitors took full advantage of Ben Pearson's straight red card. Pearson was sent off for the third time this season after hacking down Bamford when he was the last man four minutes after the restart. It swung the game dramatically in the visitors' favour as they made their numerical advantage count with a tidal wave of pressure to move two points clear of chasing Sheffield United. Leeds started brightest with Tyler Roberts forcing Declan Rudd into a first minute save. Roberts then had a shot blocked by a crowd of players following a Pablo Hernandez corner as they continued to set the pace. Preston's Lukas Nmecha hit the side-netting after getting on the end of Alan Browne's header after 12 minutes. Pearson picked up an early yellow card after fouling Jack Harrison close to the touchline with 14 minutes on the clock. Ezgjan Alioski was off target with a volley after 17 minutes, before Bamford fired over from a tight angle two minutes later. A stretching Hernandez fired another effort over the bar before Mateusz Klich shot inches wide after getting the better of Daniel Johnson. Luke Ayling had a shot blocked for a corner by Ben Davies and then Hernandez curled an effort off target just before the break. 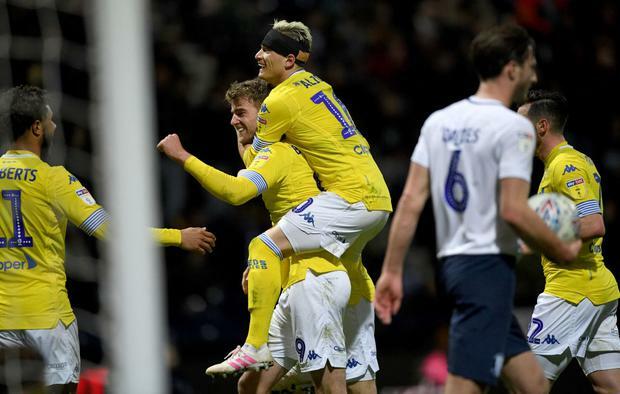 But the game changed massively when Pearson was dismissed for fouling Bamford as the Leeds striker looked to get on the end of a long ball over the top. Kalvin Phillips went close with a free-kick two minutes later, before North End survived shouts for a penalty after Harrison's cross appeared to strike an arm. Bamford had a shot beaten away by Rudd on the hour mark as the visitors cranked up the pressure. And it finally paid off when Bamford smashed the ball into the top far corner of the goal from the edge of the box two minutes later. Ayling hit the post four minutes later as United looked to make the game safe before Harrison flashed a volley wide from 20 yards. But Bamford made the points safe when he powered a header home from Klich's cross with 14 minutes to go.